The Sanford Coyote Sports Center was filled with Coyote fans on Sunday night cheering on the women’s basketball team. In the Women’s National Invitational Tournament quarterfinal game, the Coyotes (29-6) faced Texas Christian University (22-12) to determine which team would continue to the semifinal game on Wednesday. The Coyotes tried to hold on, but lost by a mere eight points, 71-79. The biggest obstacle for the Coyotes was the size of TCU’s players, especially TCU 6’3 center Jordan Moore. In the first quarter the women’s team was below their shooting average, only making a third of their shots. Even so, they only trailed TCU by three points, ending the first quarter with 16 points. Coming out in the second quarter the Coyotes kept it a close race, always keeping TCU’s lead down to five points or less. Keeping the lead was a struggle for both teams in the beginning of the quarter. The third quarter ended with TCU leading 59-55, grabbing the lead. The Coyotes faced a four-point gap in the beginning of the fourth quarter and struggled to overcome it. Bad passes and poor shots hurt the team while the Horned Frogs took advantage of the slowing offense. Junior Allison Arens said TCU’s change of play made it harder for the team to adjust. “I think what got to us is they changed their defense up a little bit, they played us in a different zone,” Arens said. Sophomore Madison McKeever made a crucial steal then layup in the fourth quarter that changed the tempo of the game. The Coyotes were coming back into the game, and had knocked down the lead, 64-66. The crowd definitely had an affect on the team, bolstering them when spirits were low but it wasn’t enough. “It’s a really good feeling to walk out on the court and see that kind of crowd,” junior Jaycee Bradley said. Coach Plitzuweit reminisced over losing three seniors; Kate Liveringhouse, Jasmine Trimboli and Caitlyn Duffy. “What’s hard for us now is saying goodbye to three really impressive seniors.” she said. 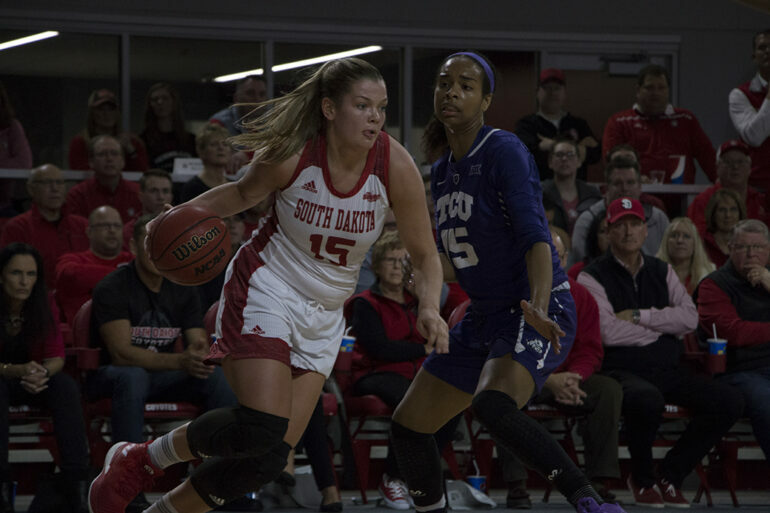 Although the women’s team had just ended their WNIT run, there was still lingering happiness about what the team had accomplished and looked forward to. “We’re gonna take time to look back on this year and celebrate and then get back in the gym and start preparing for next year,” Bradley said.